The city of Birmingham was among 5 national cities to win a coveted grant to help build Smart Cities in our country. Please join us for a robust discussion on how we can implement these proposed initiatives, what has been accomplished so far, and how our tech community can rally to continue to advocate for developijng our city for the future. 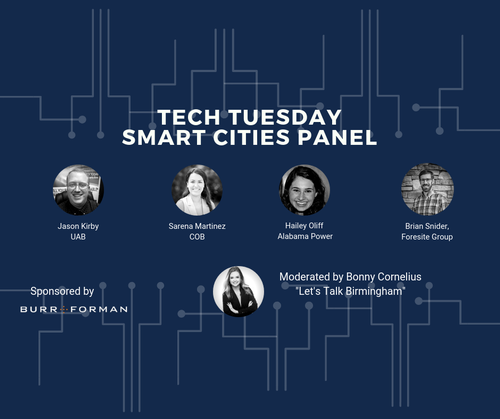 Panelists are Jason Kirby of UAB, Hailey Oliff of Alabama Power, Sarena Martinez from the City of Birmingham, Brian Snider of Foresite Group, and moderated by Bonny Cornelius of "Let's Talk Birmingham." Doors open at 11:30 for lunch and networking, program will begin at 12:00 pm. This is free to members, and $10 for non-members. Registration is recommended, and please come early to go through the security line. Please register beforehand so that you may get through security in a timely manner.